This material was provided by ITT in State College Pennsylvania, a school which has since closed. The Unknown Editor couldn't resist adding a few comments. The pictures are excellent, and no worries, they are non-ITAR. Many thanks! Check out this dimes-worth of MMICs. The three-port circuits at 2, 7 and 9 o'clock are all mixers. The "giant" circuit at 11 o'clock is a wideband, two-stage dual amplifier, the smaller circuit at 1 o'clock is a single stage amplifier, also of very wide band. The circuit at 4 o'clock appears to be a use of "digital" capabilities on a GaAs circuit (perhaps a phase shifter integrated with a shift register), which provides bragging rights for the foundry that created it but could probably be replaced with a cheaper silicon alternative. Chip and wire refers to a method of construction where size and performance matters. Yes dear, smaller is better! MMICs and discrete FETs are the order of the day for chip & wire construction. These are designed with your microstrip and coplanar layouts in mind. Most of your favorite large packaged components can be purchased in unpackaged die form. With non-microwave companies (boo!) like Analog Devices, Linear Technologies and Maxim you may have to say please more than once. Obtaining unpackaged dice (dice is the accepted plural of the word die) is a very real problem for military contractors, who need MMICs in die form but in low quantities; commercial MMIC houses often don't seem to care about this potentially lucrative end of the business. Our advice: hire some quality people, buy some inspection scopes, and show your patriotism! Chips used in chip-and-wire are not only GaAs MMICs, but include silicon circuits as well. Silicon supports RF, but also provides cheap logic and driver circuitry. Yes, you can wirebond using gold wire to aluminum pads on silicon die. Connections between components are made using ball or wedge bonding. We have a web page for wire bonding, well at least we're working on it. You'll see plenty of examples of ball and wedge bonds below. Clicking on most of the images on this page will reveal higher-resolution photos. The vast majority of circuit boards for chip and wire construction are ceramic (alumina). Everything you see on this page uses thin film alumina boards. Rogers Duroid is very good for its low dielectric constant but that soft crayon board material doesn't take well to the heat of ball bonding or the pressure of thermosonic compression. When they say "softboard" they mean it! Parallel gap welding is typically used to interconnect boards using gold ribbon. This welding can even be used to connect Rogers Duroid boards. Using chip and wire construction, packaging parasitics are reduced and you no longer have those nasty connectors taking up valuable space between each part. You can even countersink that MMIC to minimize lead length (parasitic inductance). MMICs can be placed on tabs to bring the top surface level with that of the interconnect substrate, and thereby reduce theseries inductance. But added complexity means you'd better think carefully about how much better the part is going to work and if it is worth it. In the end your goiing to have potentially greater gaps because of the tolerance stackup. Gold is the preferred medium for construction (wires, plating, traces) and those custom thin-film alumina boards are not cheap. MMICs and other active components come in passivated and unpassivated. Unpassivated means that part must be stored in a dry environment (dry nitrogen). The package your design is in must be hermetically sealed. Passivated and unpassivated, it would be embarrassing to have your design fail in a 2 or 3 years due to corrosion. Hermetic housings don't come cheap, you can figure a minimum of $100 for the simplest housing, before plating. Special ball, wedge and welding equipment cost much more than a Radio Shack solder station. Your technicians are either working under a microscope or have the eyes of the Six Million Dollar man. The images below will combine some of the gifts that the Gods of electronics have given us. Below are two MMIC amplifier pairs in balanced configuration with two-section Wilkinsons to split/combine the signal. Wilkinson are in-phase divider/combiners, two sections implies that this module is intended for wide bandwidth. If you want the benefit of improved 2nd order cancellation, the split phase needs to be rotated by 90 degrees (in quadrature). Lange couplers shorted at two ports are used here to rotate transmission phase by 90 degrees with respect to a "through line" of the same length, a clever use of this ubiquitous coupler. In the lower left and upper right of the ceramic boards, ribbon was welded down to reduce the path length. This type of tuning is often performed on chip-and-wire modules, both before and during test. 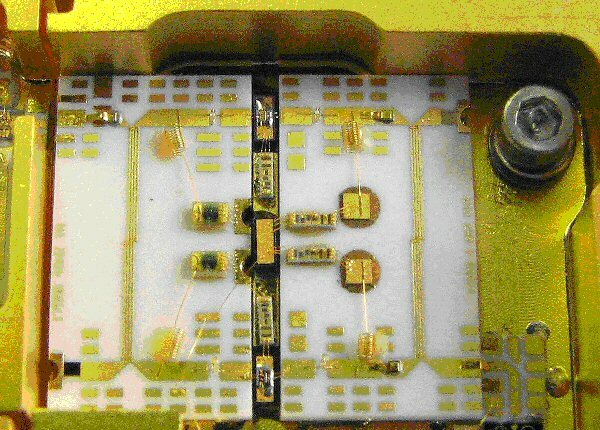 The "DC" feedthroughs through the floor and the RF connector (which is 2.4mm judging by the threads) pointed northward give a hint that this is a double-sided module. The lid must fit the profile of the module cavity, because it is non-rectangular, we can assume that the lid will be laser-sealed as opposed to seam-welded. Chip & wire construction can be used to make all types of circuits. Below is a dielectric resonator oscillator (DRO) feeding a broadside coupler and a MMIC wideband distributed amplifier. Above and below the amplifier die are multi-tap resistors used for adjusting the bias voltages of the MMIC. Note the "chicken dots" on many of the substrates. These are used to provide a means of tuning the circuit; by bonding to them, small amounts of shunt capacitance can be added. Typically, an engineer or technician will make a tuning stick from a wooden swab, by trimming the base to an are similar to a single chicken dot, then contacting the substrate in along microstrip traces while watching circuit response on test equipment. When improvements are found, the circuit is sent back to the wirebonder and the nearest dot is jumpered to to the trace, and the circuit goes back to test to verify performance and perhaps some further tuning. Why are they called "chicken" dots? Its because the designer chickened out on his design being perfect, and planned for an easy way to tune during test. Click here if you have 11 minutes to waste watching the Brak Show episode where Mr. Bawk Ba Gawk, a school mascot, is kidnapped. Carrier plates allow sub-components to be separately assembled and tested before integration into the housing. It takes a steady hand and good tweezers to place and tighten the hardware (screw and washer) without dropping something on top of a gold wire and messing up an entire days work! The tradeoff between carriers and no carriers in a housing is complex, you have to weigh the advantages (ability to pretest, easy replacement) against disadvantages (additional parasitic inductance between carriers, potential ground plane problems), and more parts on the bill of materials. Screws by the nature of their manufacture are filthy things, they come with machine oil residue and chunks of metal left over from the threading operation. You should always clean hardware using ultrasonic bath using a benign solvent like isopropyl alcohol prior to installing inside microwave modules.